08 FebThousands of People Live and Work in NOMA, Where are the Sit-down Restaurants? Walk around DC’s NoMa neighborhood and you will see glass-box office buildings, new apartment towers filled with Millennials and several construction sites where more will soon deliver. But look for a sit-down restaurant to grab dinner and cocktails, and you will come up empty. While DC’s restaurant scene has undergone a renaissance in the last few years, with chef-driven concepts opening all over the city and Michelin handing out its first-ever stars to restaurants in the nation’s capital, the actively developing NoMa neighborhood has been left out. The neighborhood has at least 12.8M SF of office space and 4,800 existing multifamily units, according to NoMA BID, with another roughly 3,000 units in its two-year pipeline, according to Delta Associates. But it still lacks any full-service restaurants where workers can bring clients for lunch or residents can meet for dinner and drinks. (The only place to get beer on tap in NoMa is the outdoor Wunder Garten.) It has several fast-casual spots — including Seoul Spice, Moe’s, Roti and Potbelly — but some close early at night, others don’t open on the weekend, and they do not satisfy the growing need for full-service options. Restaurants have tried to open in NoMa. Union Social opened in MRP Realty’s Washington Gateway in October 2015 but closed less than a year later. MRP principal Matt Robinson said the firm is in talks with groups to fill the space but has not closed a deal yet, and he is hoping to get a full-service restaurant signed as soon as possible to activate the building’s vacant frontage. Mint Indian Food Bar opened next to the Metro station in 2014, across Florida Avenue from the Union Social space, but closed a couple of months ago. Papadopoulos Properties president Tom Papadopoulos, who has been marketing the space, said he signed a letter of intent there with another fast-casual eatery. His firm is also marketing the 5k SF restaurant space in the Hilton Garden Inn, where Watershed recently closed. The struggles faced by NoMa’s first wave of restaurants could be a sign that the neighborhood wasn’t ready yet, Miller Walker Retail principal Bill Miller said. Some attribute NoMa’s restaurant void to how recently the neighborhood has sprung up, with the office momentum coming in the last decade and most of the residential growth within the last five years. StonebridgeCarras principal Doug Firstenberg, who developed several of the new buildings in NoMa, said that when they first delivered, the neighborhood was less attractive for full-service restaurants. Now that it has become a hotter place to live, many of the prime spaces are already filled by fast-casual spots, cafés, banks and dry cleaners. The brokers who represent restaurant users say the interest for space in NoMa is still not there yet. Miller said with so many hot restaurant neighborhoods like 14th Street and the nearby Union Market and H Street, NoMa has been largely overlooked by restaurateurs. When sushi chef Yoshi Ota was looking to open a DC location, he looked at NoMa and more established neighborhoods like Chinatown, Capitol Hill and downtown DC. Working with Neighborhood Retail Group, Ota ultimately decided to open downtown at 1420 New York Ave. NW. Multiple spaces are still marketing to potential restaurant users. Douglas Development’s Uline Arena, anchored by a flagship REI, has roughly 23k SF of retail space available, including a 6k SF spread with outdoor seating on the corner of 3rd and M streets NE. Douglas marketing director Laurene MacTaggart said she expects a bar/restaurant concept to sign there, and believes a deal will get done this year. Brokers expect the stretch of 3rd Street from Uline Arena up to Florida Avenue, where Trader Joe’s is opening later this year, to be a prime area for restaurant openings in the next two years. At 301 N St. NE, Foulger-Pratt is building a two-building project with up to 35k SF of retail. It includes a three-story space in an adapted former printing press building that is expected to be available for users later this year. Across from that site at 1200 3rd St. NE, Trammell Crow/High Street residential is planning a three-building mixed-use project with 50k SF of retail. Multiple projects are in the pipeline a few blocks west, where brokers also expect full-service restaurants to open. The JBG Cos has signed Landmark Theatres to anchor its multi-phase Capitol Point project at 51 N St. NE, which could attract restaurants to fill in the rest of its ground-floor retail. Wood Partners has a 5k SF space it is setting up for a restauarant tenant in the 346-unit apartment building it is developing at 33 N St. NE. The building is expected to deliver early next year, and Wood Partners director Scott Zimmerly said he has not begun talking to potential restaurant users yet, but aims to soon. Skanska has 35k SF of retail space in the Tyber Place project it is building along the planned NoMa Meander, a four-block pedestrian promenade that will stretch through the Skanska and JBG developments. Skanska executive vice president Mark Carroll said Tyber Place has three locations targeted to restaurants with at least 5k SF and outdoor seating. He said he has had early discussions with potential users who have shown interest. “We have gotten some interest from local chefs who have the same viewpoint as us that there is a real need for good, high-quality restaurant operators,” Carroll said. 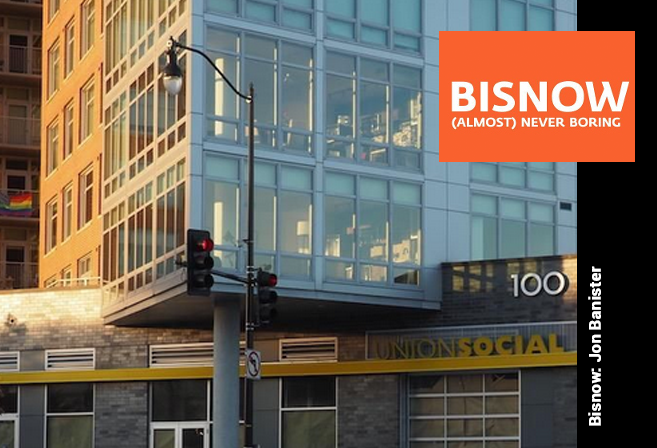 NoMa will likely be a hot topic on March 23 at Bisnow’s Northeast DC Update, where Firstenberg, Zimmerly and Jasper will speak, plus principals at MRP and Foulger-Pratt.